There’s a word used by e-retailers everywhere that’s a clarion call to me, and I pretty much skimp through all other emails by retailers until I see it. Yep, that word is “SALE”. Needless to say that’s probably most women’s (and some men’s) Achilles’ heel. Instead of charging to the department stores all wild-eyed and eager, I do most of my shopping online these days, browsing through products at reduced prices in the comfort of my own home. Some days though, I change my mind midway while browsing – I might find something better to do (oooo… shiny) or decide I want to hang on to my savings that month instead. And here’s when the frontrunners in the email game really get a chance to step up with their event triggered email campaigns. Run out of patience before finding something to your liking? No problem! BCBGMAXAZRIA sends you an email some time after you have left their site, with the subject line: Yep, I definitely was. Clicking upon the email, I was greeted by BCBGMAXAZRIA’s recommendations of outfits I might be interested in. It’s clear they knew I was looking for items on sale as evinced by the email copy. The email also has another section on popular styles if the above selections did not work for me. Hmmm. Very nice. They got their second clickthrough. And look… free shipping! Now, if I had for some reason picked out some items I wanted and then had the audacity to abandon cart… I get this personalized email instead. The email surfaced by this personalized subject line contains items that I had placed into my cart, making it just that much more effective since these are items that I actually want. And just to be sure that they capture every little bit of revenue that could possibly squeeze out from me, the email has an added section cross-selling similar outfits. As you can see from the emails, BCBGMAXAZRIA has succeeded in implementing a rather effective email marketing campaign that is highly personalized and relevant to my interests – that’s pretty much the gold standard of email marketing, where your customers actually appreciate receiving promotional emails from you. 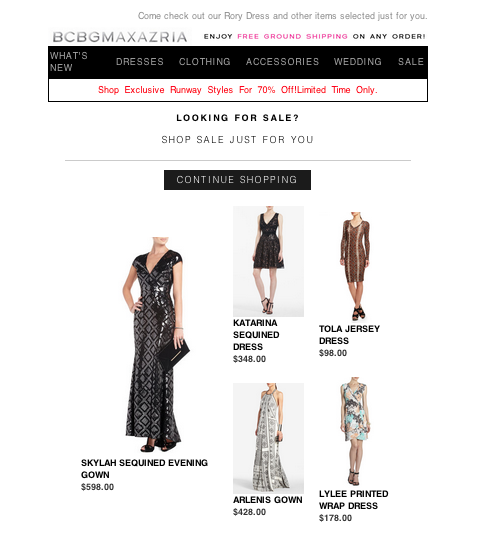 Much like Kobo’s effective email marketing campaign, which we wrote about earlier, BCBGMAXAZRIA adhered to certain best practices in their event triggered email campaign. Personalized subject line – A personalized subject line drew my attention, especially when I saw that the email was coming from a brand that I was looking at just a couple of hours ago. 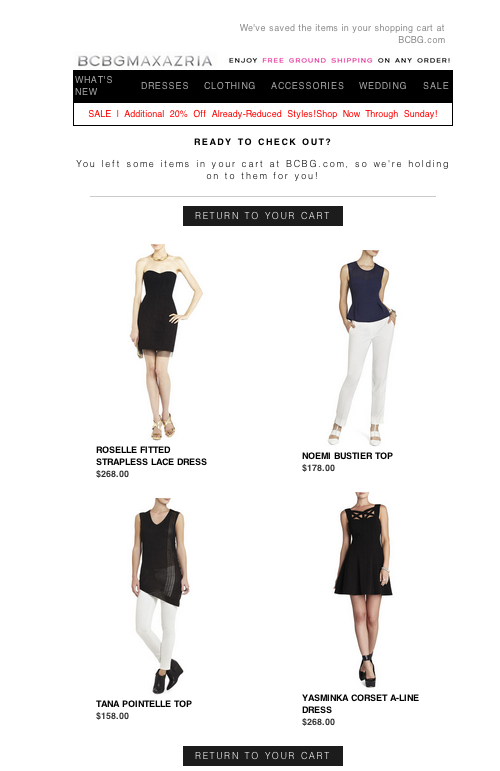 Content relevance – The email content sent by BCBGMAXAZRIA was highly relevant to my interests. No surprise, since they were using items that I had already placed in my shopping cart as a hook! Smart timing – Using automated event triggered emails at the right time is key. BCBGMAXAZRIA was able to catch me at a time when I was already actively engaged with the brand and just a slight nudge away from purchasing. Social media options – BCBGMAXAZRIA’s email featured other social platforms, offering customers their preferred choice of communication channel for engaging with the brand. Convenient for me, smart for the retailer to provide options to re-engage. 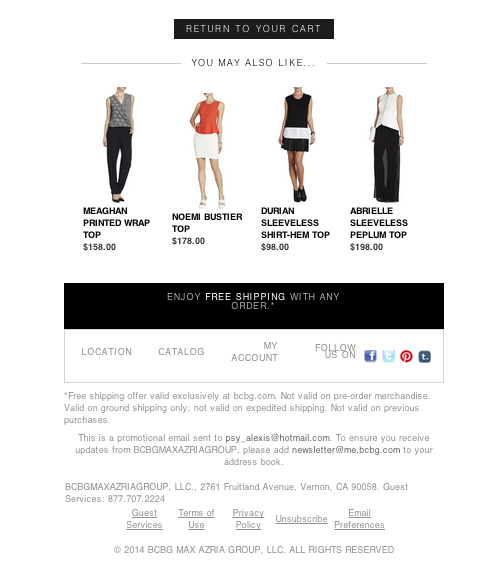 Cross-selling – In each of BCBGMAXAZRIA’s emails, the brand was upselling other popular or similar items at each touchpoint. Clear call-to-action – While the call to action for the first email was to “Continue Shopping,” the second was clearly to “Return to Your Cart”- calls to action that were repeated twice in each email. Safe List – To ensure their emails don’t end up in the spam box, BCBGMAXAZRIA encourages customers to add them to a safe sender list, killing two birds with one stone: education and deliverability. Unsubscribe – Happily, we can report that BCBGMAXAZRIA does have an option for customers to unsubscribe. Brand identity – By utilizing a consistent brand identity across both the site and their emails (stark black and white) BCBGMAXAZRIA ensures that the customer has a unified user experience across different channels and platforms. Minimal copy – Sometimes, a picture says a thousand words. In this instance, it certainly does. BCBGMAXAZRIA dispenses with long copy, instead using visuals to make the sale instead. There are some things that I might have done differently, such as positioning the unsubscribe and the safe sender list call-to-action in a more prominent area. It would have also been interesting if they had swapped the subject lines on both emails, for example using “You were checking us out” for an email that was supposed to drive the action of actually checking out my shopping cart (pun fully intended), but all in all, I thought BCBGMAXAZRIA is running a pretty great event triggered email campaign! As to whether or not I converted, let’s just say I just might have a couple of new dresses hanging up in my wardrobe. You’ve got your promotional emails looking and reading just the way you want them to. Now let’s move on to your transactional emails. Get the Transactional Messaging Best Practices E-Book to see what you can do to drive more revenue. Excellent! How did BCBGMAXAZRIA acquire your email address? I imagine this is only for garnering repeat business from existing customers?